Almost 200 flights have reportedly been cancelled at Denver International Airport Thursday after blizzard delivered over two inches of snow and 30+ mph winds to the area in an intense spring blizzard. There were 185 reported cancellations and 47 delays at the airport. Significantly fewer than the 750 cancellations reported Wednesday. Crews worked overnight to clear the airfield and roads of snow and ice. Colorado Springs Airport has seen very little effect in the storms aftermath. No flights have been canceled as of early Thursday morning. Some snow flurries could still fall Thursday in Denver according to the National Weather Service in Boulder. The bulk of the storm has pushed into the Midwestern States. There remains a 30 percent chance of snow showers on Thursday. There are reports of gusting winds up to 33 mph and icy roads but it is unclear whether that will have any effect on incoming or outgoing flight schedules. Airlines have been allowing travelers to change their flights to avoid the storm, dubbed Winter Storm Wesley. 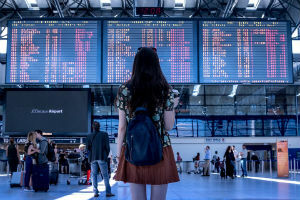 Travelers are generally allowed waivers In order to accommodate for flights cancelled, but policies vary by airline.